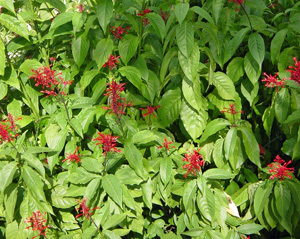 Firespike, Odontonema strictum is also known as Cardinal Guard or Scarlet Flame. This native of Mexico and Central America is an easy plant to grow. I took cuttings years ago from my mom's Central Florida Garden, easily rooted them and stuck them in the ground. They are still doing well even with much neglect. They tend to weather all but the worst droughts. They can also be propagated from seeds. The bright red spikes always add welcome color to a hot weather garden. They can grow to around six to eight feet in height in full sun or partial shade, with well drained moist soil. Hummingbirds and bees love this plant.